Despite their endless push for more tolerance and acceptance, liberal democrats have a tendency to not only reject but viciously condemn anyone who doesn’t think the way that they do. They believe in diversity for all… unless you happen to believe that the Hummer that you drive to work every day really isn’t contributing to the end of the world. They stand for inclusiveness… unless you are a member of the NRA and carry a gun for self-defense. They think that we should all come together and accept people who are different… unless you voted for Donald Trump in the 2016 presidential election. In other words, unless you are an anti-gun, anti-rich, open borders environmentalist, you are either shunned, or more commonly, aggressively attacked. There are few places where this left wing hatred manifests itself more than in Hollywood, which in recent years has practically become the capital for all things liberal and politically correct. It makes sense that there would be so much hostility towards conservatism inside Hollywood. After all, it’s not exactly a secret that the vast majority of actors and actresses are outspoken progressives. It’s also worth noting that dozens of Hollywood stars openly supported and even campaigned for Hillary Clinton while she was out on the campaign trail. These stars include but are not limited to: Demi Lovato, Amy Schumer, Sarah Silverman, Ellen DeGeneres, Elizabeth Banks, Kat Dennings, Bryan Cranston, Drew Barrymore, Shonda Rhimes, J.J. Abrams, Steven Spielberg, Scarlett Johansson, Kerry Washington, Olivia Wilde, Jamie Foxx, Samuel L. Jackson, Reese Witherspoon, Julianne Moore, Lena Dunham, Robert De Niro and George Clooney. 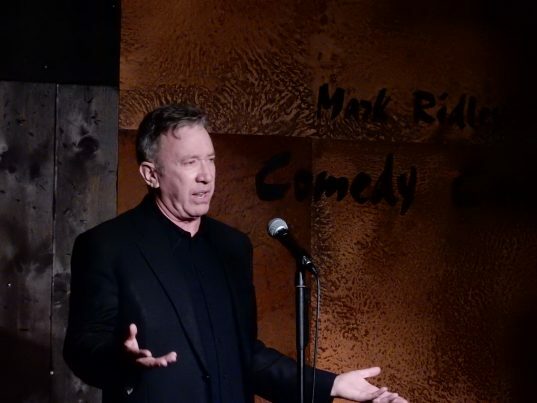 The evidence is overwhelming – Tim Allen hit the nail on the head when he said that being a conservative star in liberal Hollywood was like living in Nazi Germany. Not only are conservatives heavily outnumbered, but as Allen pointed out, the Hollywood leftists don’t hesitate to attack. It is, in many ways, an ideological holocaust.